Shawls rock my knitting world. They’re smallish projects, so they work up quickly and encourage me to try new lace motifs, embellishments, and shaping techniques. They’re eminently practical for every season of the year; I get chilled easily, but when my shoulders are warm, the rest of me is warm, too. Best of all, I only have to make ONE—no second-sock or second-sleeve syndrome! 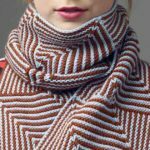 The Twists & Turns Wrap from Knitting Traditions 2018 combines all of these wonderful elements, plus a dash of human interest. Here’s the backstory for this lovely crescent shawl: designer Carol Huebscher Rhoades wanted to honor one of her favorite late Victorian authors, Lady Mary Anne Barker, who lived all over the British Empire and pursued several different careers (see Carol’s article in Knitting Traditions 2018 for further details). For the wrap’s body, Carol chose 2 zigzagging lace motifs to represent Mary Anne’s ups and downs. For the edging, Carol worked a 5-color edging of Latvian twists. If you’ve never tried these techniques before, the Twists & Turns Wrap offers a golden opportunity. Latvian twists look impressive, but they’re not difficult (and this edging is perfect for that mini-skein set in your stash). The same goes for lace: once you learn to read charts and “read” your knitting, you can conquer any lace pattern. Start with these simple motifs. 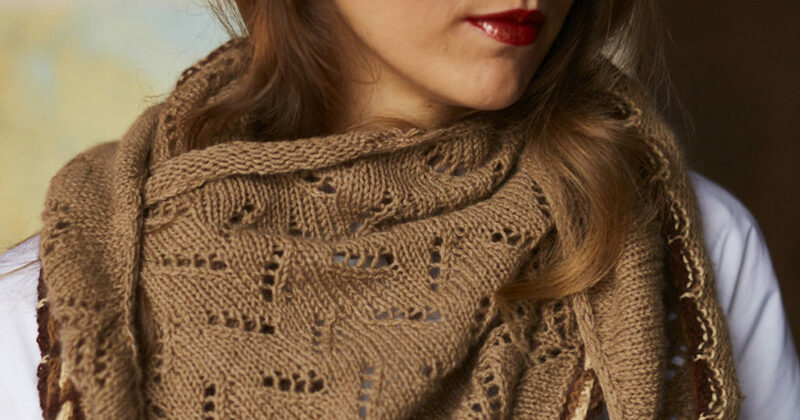 When you’re done knitting, wear this beautiful shawl any time you need some warmth or a little oomph for an outfit. FINISHED SIZE 21¼” tall at center and 76″ wide. (100% extrafine Australian Merino; 99 yd [90 m]/¾ oz [20 g]): apricot (cream; CC1) and chocolate (dark brown; CC2), 1 skein each. Sunday Knits Angelic 3 ply (75% extrafine Australian Merino, 25% ultrasoft French angora; 99 yd [90 m]/¾ oz [20 g]): nut (light brown; CC3) and chestnut (medium brown; CC4), 1 skein each. NEEDLES Size 7 (4.5 mm): three 40″ circular (cir). Adjust needle size if necessary to obtain the correct gauge. GAUGE 22 sts and 24 rows = 4″ in St st with MC.